As Australians we know that life can be fragile. Bushfires and floods are a sobering reminder that disaster can strike quickly and unexpectedly. The same is true for millions of people in the developing world. When disasters or conflict strikes, hope can beat a hasty retreat. The life and teachings of Jesus reveal a big vision of hope. The Good News is about the renewal of God’s world. Through the life, death and resurrection of Jesus, the kingdom of love, justice and peace has broken into history. We are invited to respond to this message by providing hope where there is none – to be the hands and feet of Jesus in a broken world. One of the ways Anglican Overseas Aid does this is by responding to disasters and emergencies. Through the generous donations of Anglicans in Australia, we continue to provide new beginnings in many challenging situations. The aim of our work is to see new life rising again! In recent times we have provided hope to people in places such as South Sudan, Syria, Gaza, Northern Iraq, Vanuatu and Nepal. Whenever we open an appeal for a disaster or emergency, our supporters are incredibly generous. But when a disaster strikes, we need to act quickly to save lives. It takes time to launch an appeal, collect donations and send the money to the affected country, and the reality is that many disasters are smaller in scale and don’t warrant launching an appeal. The other reality is though that there is a steady increase in emergencies and their impact on vulnerable people around the world. The UN estimates that about 78 million people were affected in 2015. And when disaster strikes, it undoes much of the hard work communities have already done in building for their future. We need to be ready to respond. Our Rapid Response Emergency Fund enables us to respond quickly and effectively to reduce the impact of disasters and get people back on their feet as soon as possible. As Anglicans we are inspired by Jesus to provide hope for others. Together we can help move people from no hope to knowing hope! Your donations will either be sent directly to our partners if we work in the affected area or we will join with the ACT Alliance using their networks to provide basic necessities such as food, safe drinking water, shelter, and good hygiene practice. Please donate to our Rapid Response Emergency Fund via our donation page so that we can be prepared, or call 1800 249 880 (Free call within Australia). Find out more about disasters and emergencies that we are currently responding to here, and learn about our response to previous disasters here. 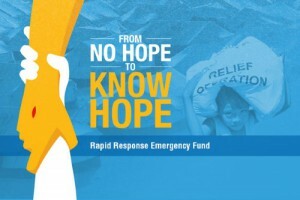 Donations to our Rapid Response Emergency Fund enable us to respond quickly when an emergency strikes around the world, taking people from no hope to knowing hope. Donate securely online now, or use the below phone and mail details.